Small to medium businesses are finding the BusinessRecycling service and NSW Environment Protection Authority's Bin Trim tool critical to implementing their green initiatives. And not just in the cities. BEST Employment, a regional organisation based in the northern NSW town of Inverell, provides employment services for those most disadvantaged. 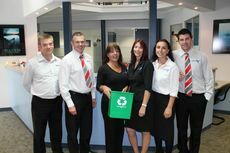 The company also wanted to show leadership in sustainability which is where BusinessRecycling and Bin Trim came in. The BusinessRecycling website was vital for their research into what they could recycle. The business targeted materials such as plastic, paper and cardboards in their offices and staff kitchen. It not only demonstrated to BEST Employment the environmental benefits of recycling but also provided the tools to use, such as free flyers and posters, to help communicate the initiative to staff. The use of the NSW Environment Protection Authority's Bin Trim tool helped measure the amount of recyclable waste before the implementation of the new initiatives, allowing a comparative measure once in place. The ‘BEST' thing after 12 months of the initiative was the 25 per cent increase in recycled waste. As Roger Abbott, their Quality and Projects Coordinator said, "Small changes in behaviour an have large impacts in reducing waste." Read the full case study plus many more.